Win tickets to the Miguel Bosé Amo Tour on 8 De Noviembre 2015 at Viejas Arena (5500 Canyon Crest Dr, San Diego, CA 92182). We are holding a Trivia contest on our Twitter account and Facebook Page starting tomorrow, Monday November 2. Monitor #hoptickettrivia to get the question each day. Make sure the follow us on Twitter or like us on Facebook to qualify for entry. 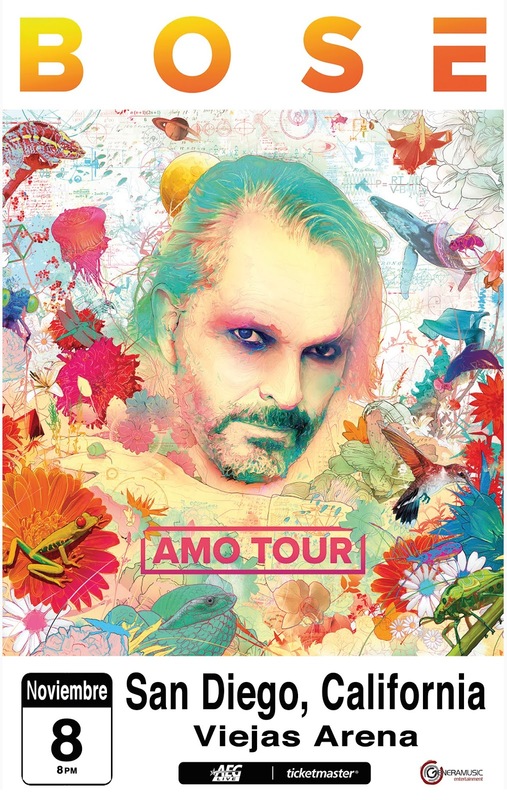 Preliminary Information: The Miguel Bosé Amo Tour ticket giveaway ("Contest") will begin on November 2, 2015 at 8:00 AM PST and end on November 4, 2015 11:59 PM PST ("Contest Period"). Entry deadline for each question must be received by 12:59 PM PST that day, drawing to be held on November 5, 2015. All times in the Contest refer to Pacific Standard Time ("PST"). Eligibility: Contest is open to those who are 21 years of age or older as of the date of submission of the start of the Contest Period. Twitter: To enter the Contest, during the Contest Period, Follow @houseofpanama on Twitter and monitor the #hoptickettrivia hashtag. Then, submit the correct answer ("Entry") to the current days' trivia question. Entries for each question must be received by 12:59 PM PST that day. You may enter once per day during the Contest Period. Multiple entries received from any person beyond this limit will void all such additional entries. Entries that are incomplete are void and will not be accepted. Facebook: To enter the Contest, during the Contest Period, Like the houseofpanama Facebook page and monitor the #hoptickettrivia hashtag. Then, submit the correct answer ("Entry") to the current days' trivia question. Entries for each question must be received by 12:59 PM PST that day. You may enter once per day during the Contest Period. Multiple entries received from any person beyond this limit will void all such additional entries. Entries that are incomplete are void and will not be accepted. Prizes: Three (3) Prizes – Each winner will receive 2 tickets to the Miguel Bose concert on November 8, 2015 at Viejas Arena. No substitutions, cash equivalents or transfer of prizes is permitted. Sponsor reserves the right to substitute any prize of equal or greater value in the event any prize cannot be awarded as stated. In no event will more than the stated number of prizes be awarded. Drawing: A random drawing will be held on November 5, 2015 from among all eligible entries. Odds of winning will depend on number of eligible entries received. The winner of the First Prize will not be eligible for other prizes. To Claim Prize: All winners will be notified of the results by November 5, 2015. Tickets will be available for pickup at will call on the day of the concert, November 8, 2015. Release: By acceptance of any prize, the winner agrees to indemnify, release and hold forever harmless the Sponsor, House of Panama, their agents and representatives and each such company's officers, directors, employees and agents (collectively, the “Released Parties”) from and against any claim or cause of action, including, but not limited to, personal injury, death or damage to or loss of property, arising out of participation in the Contest or in connection with receipt and/or use of any prize or any travel in connection therewith. General Conditions: Sponsor reserves the right to cancel, suspend and/or modify the Contest and award the prizes from among eligible entries received prior to such action if any fraud, technical failures or any other factor beyond Sponsor's reasonable control impairs the integrity or proper functioning of the Contest as determined by Sponsor in its sole discretion. Sponsor reserves the right in its sole discretion to disqualify any individual it finds or suspects to be tampering with the entry process or the operation of the Contest or to be acting in violation of these Official Rules or in an unsportsmanlike or disruptive manner. Sponsor's failure to enforce any term of these Official Rules shall not constitute a waiver of that provision.